The Bayfront Charter High Sharks. 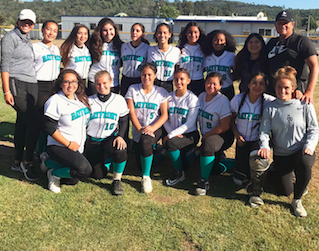 JULIAN (5-23-2018) – On Tuesday (May 22), two teams with connections to the region battled in the CIF Division V softball championship, as the third-seeded Julian Eagles were eliminated by Bayfront Charter of Chula Vista, 5-1. 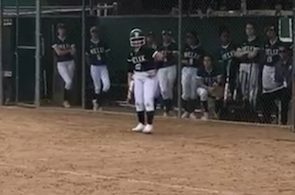 Sharks junior first baseman Alex Rangel snapped a 1-1 deadlock in the 6th inning, drilling the ball over the head of the center fielder for a 3-run triple to send Bayfront – coached by former East County player of the year Mary Grabowski out of Christian High – to the victory. Grabowski noted that many of her players had never been in the Cuyamaca Mountains, so it was a long yet happy trip back to the city. 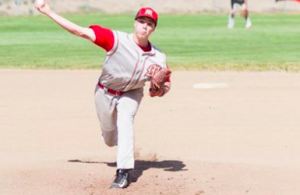 Bayfront (16-9) capped the regular season winning 11 of 12 contests, but Julian’s 13-4 regular season mark earned the Eagles the third seed, despite no significant victories. The Eagles finish at 14-6. 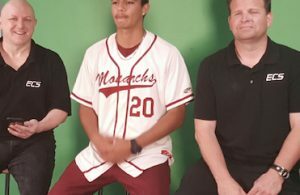 In fact, among the four losses, they scored just six total runs while yielding 46 (including losses of 10-0 and 13-2 to Foothills Christian). Meanwhile, Bayfront’s Sharks blanked the Knights, 6-0, again making an argument against the controversial CIF playoff seeding formula. Two rounds of ballgames will be held at Sportsplex USA, both in the elimination bracket. The top to survive then has a 24-hour turnaround to Friday’s D-5 title game for the San Diego Section crown. 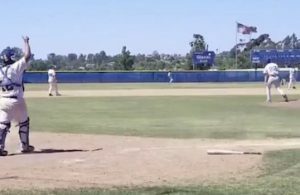 Meanwhile, the top-seeded Lions of Liberty Charter (17-4) will tangle with the Frogs of Guajome Park Academy of Vista in Thursday’s winners’ bracket final. The victor goes to the title game; the loser sticks around for another game in form of the losers’ bracket final.